Kauai has a reputation for being the most beautiful and the wettest of the Hawaiian islands. The summit of Mt Waialeale is often the wettest spot on the face of the earth, averaging 480 inches of rain a year. All that water has to go somewhere, and as the streams carve their way from the mountains to the ocean, they create hundreds of dramatic waterfalls. A few of these waterfalls can be seen by stopping at an overlook and getting out of your car; others require a little bit of hiking. The VAST MAJORITY of Kauai’s waterfalls can only be seen one way though … by doing a helicopter tour. We can’t imagine spending all that money to come to Kauai and not spend a little bit more to really see the entire island while you are here. 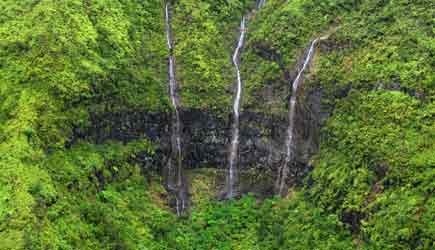 A helicopter tour of Kauai will astound you with spectacular waterfalls too numerous to count.